Welcome to Our Extended Stay Hotel in Alcoa, TN Searching for a relaxing setting in the Appalachian Mountains with a convenient location near downtown Knoxville? Then look no further than the Candlewood Suites extended stay hotel in Alcoa - Knoxville Airport. Our hotel's amenities include a free shuttle to McGhee Tyson International Airport TYS, also known as the Knoxville Airport. Our hotel's guests enjoy a variety of attractions, from seeing a game at UT's Neyland Stadium to a movie at the Palace Theater and Espresso Bar. For some outdoor fun, try a round of golf at the Pine Lakes Golf Course or a picnic at the Springbrook Park & Duck Pond, the largest park in Alcoa. Our hotel's location is also convenient to the Air National Guard, Alcoa Aluminum, Denso, Coca Cola Bottling Co, Kimberly Clark, the University of Tennessee and other businesses in downtown Knoxville. Business travelers can work efficiently in the 24-hour business center or at each suite's over-sized desk with a speaker phone and free high-speed Internet access. We go beyond other extended stay Alcoa, TN hotels to offer you great amenities, like free laundry facilities, a relaxing pool and a 24-hour Candlewood Cupboard convenience store. Each suite has a fully equipped kitchen, comfortable bedding, a 32in TV with a DVD player and a large workspace with free Internet access. 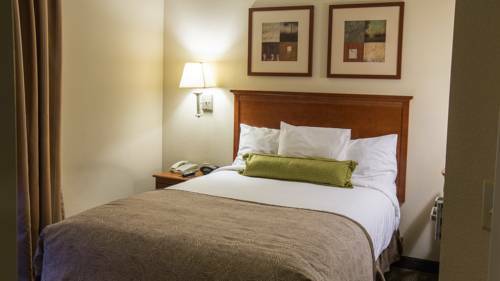 A suite awaits you at one of the best pet friendly Knoxville airport hotels.